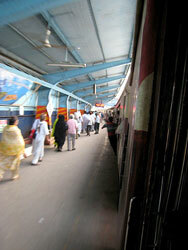 Indian Railways (IR) has one of the largest and busiest rail networks in the world. The Indian Railways rail routes cover the length and breadth of the country transporting 20 million passengers and more than 2 million tonnes of freight daily. The Government of India owns and controls the Indian Railway. 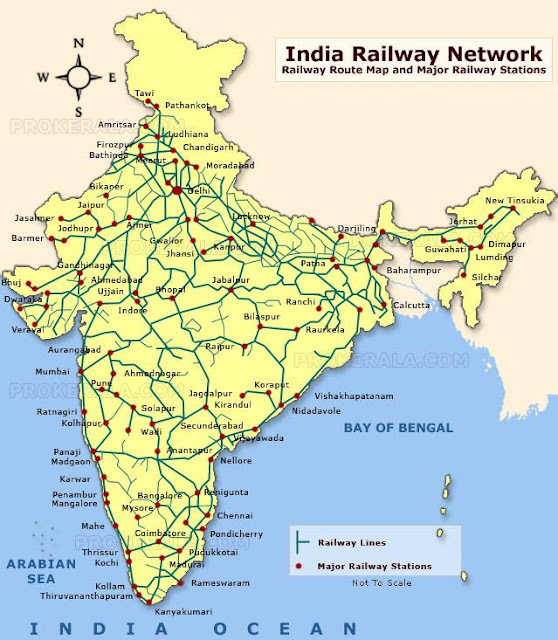 The railways system in India is divided into Zones which are further sub divided into divisions. As of 2010, Indian Railway consists of 16 zones and 67 divisions. The India Railway Map given here will help you understand the Railways system in India better. I’m sharing my practical knowledge about the India railway system, the Indian train, and the India travel ‘culture’. The information in this article covers what to expect when traveling on the India Railway system (as well as what not to expect), types of Indian train classes, India railway facilities, cost of travel on Indian trains, and instructions on making offline and online India Railway reservations. It is practically impossible to fully explain the India railway system in one article. Even for an experienced traveler, there are many unknown though useful aspects of train travel in India. I hope this article will enlighten anybody who is keen to know about the India train and the India railway system. This article is not meant to be the sort of guide you’d see at the http://www.irctc.co.in/ info site, guides etc. Instead, I’m trying to take a hands-on approach on train travel in India to give you a real ‘feel’ of it. Knowing the Indian train and the India railway system will go a long way to making your India travel a comfortable experience. Well, it’s in the front with the driver and his assistant! The guard at the tail end of the train is the person in charge of the train. Indian trains run on diesel or electricity, depending on the route. 2 to 4 coaches in a train, usually 2 just behind the engine and 2 at the end of the train. You need not have any reservations for traveling in second class. You can buy tickets from the counter at the railway station, even when the train is standing at the platform ready for departure. Second class is the cheapest way to travel on the India railway system for me. For less than $10.00 USD, for example, you can travel about 3,000 kilometers (yes, three thousand!) from Trivandrum to New Delhi. The only catch is that there are no seat reservations. No sleeping berths either, so you would have to sleep sitting up for 2 nights. If you do manage to get a seat, there is no guarantee that you can hold on to it. You need to keep your luggage, or any other personal object, on the seat when you go to toilet or walk around the train. An empty seat is open for anyone, including you, to occupy! The facilities for second class on the India railway system are a bare minimum: food is available from the vendors; there are four squat-type toilets with water attached to each coach; fans are provided; two washbasins are also available at both the ends of the train. Tip: bring a small chain and a padlock to secure your luggage beneath a seat or over the luggage rack. Depending on the season or route, the second class on the Indian train may get overcrowded. I’ve traveled many times in this class during the peak India travel season, and a couple of times I had to breathe through my neighbor’s nose! The coaches get especially crowded during the Indian summer season, and there is a large passenger overflow into second class from other classes due to the overbooking of reservation. You will see the poorest class of Indian people in these compartments, but if you want to get a feel for the "raw India", then traveling in the second class is the best bet. The people are generally accommodative, and are more than happy to talk to strangers. A foreigner will surely generate a lot of curiosity. You take definitely the first step in striking up a conversation, but use your common sense and good judgment to assess the situation. You will know they are interested when they bombard with you with a lot of curious questions. Be prepared to answer a lot of personal questions! Some standard questions you will be asked on your India travel journey are "Where you are coming from? What is your profession? How much you earn a month?". Your answers will lead to additional questions! Don’t be offended by the personal nature of the questions. This is how people in India socialize. Surprisingly, they may not ask your name. They think this is too personal a question to be asked! An average Indian has an infinite number of questions to ask. Don’t be offended. This is how the Indian culture is. Asking questions is not considered impolite. My advice is to roll with it, rather than fighting it or getting upset. A poor Indian is of the impression that all western tourists are infinitely rich, and that they have more money they know what to do with it. Otherwise why would they travel around the country and waste a lot of good money? Even the well-to-do Indians share the same opinion. 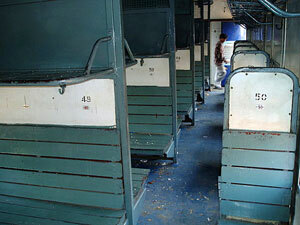 The sleeper class in the India railway system is the main chunk of a typical express train. Each coach holds about 72 passengers, with about 10 to 15 coaches per train. You will need a reservation to travel in this class of the Indian train. Reservations can be made 60 days prior to your journey at the most. Once reserved, your name will be listed on the chart stuck next to your coach’s door outside. A copy of the same is displayed at the departing station “Reservation Chart” notice board about an hour before the departure. The coaches are indexed as S1,S2,S3, and so on. Lookout for a square white paper label stuck on the side of the door with the coach number marked on it. The same is also printed on your ticket. Most of the stations have a notice board indicating the position of the coaches from the engine. If this is not displayed, ask the staff at the railway station for your coach. Try to locate your coach prior to the arrival of your train so that you can avoid the mad-tourist dash up and down the length of the train with your huge backpack. The middleclass massed of India travel by this class. Next to your seat will, in all probability, be a newly married Tamil couple who will speak reasonably good English, an old lady who is not very happy with you to begin with, her middle-aged daughter who speaks Hindi only, and her inquisitive young boy who want to know everything about you. For a budget traveler Second Class sleeper is THE most suitable mode of transport. 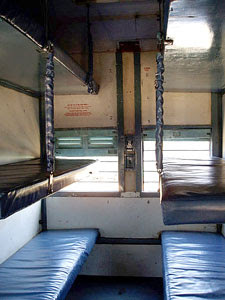 The seats in the second class sleeper are grouped into semi-private sections of 6 seats - 3+3 facing each other, with upper berths, middle berths, and lower berths. The lower berth is the primary seating for the passengers during daytime. 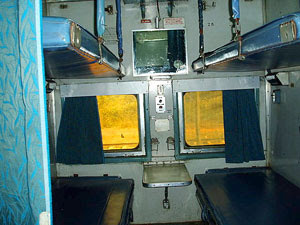 Seats in the second class convert into sleeper berths at night. Don’t get offended if an older passenger asks you to exchange your lower berth with his upper berth. Generally, younger people consent to this as a courtesy to the senior passenger. 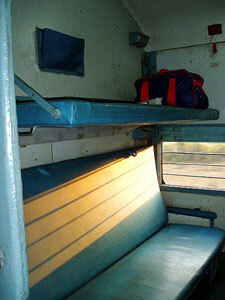 The upper berth on the Indian train is undisturbed and can be used for sleeping during the daytime as well. Lower berth passenger gets the window seats during the daytime, although generally you will see a lot of co-operation among the "6 member berth family" in berth-swapping. On the other side of the walkway is a row of ‘’Side Berths”. These are twin seats facing each other. If you are taller than 5.5 feet, though, these side berths are going to be a little short for you to sleep on. But both of these seats are window seats and you won’t trouble the other passengers when getting up walking around, like the trouble created for the mid and aisle passengers sitting in a row during an airplane flight. Try to avoid, if possible, the first and last 16 seats of the 72 seats in each coach on the Indian train, as they are close to the doors and toilets. You may be annoyed by the traffic near the door and toilets, just like the last row in an airplane. The light that stays on at night at these sections of the compartment might also annoy you. Chains are provided by the India railway to secure your baggage, but bring your own padlock. Your luggage can be pushed under the seat. This is the air-conditioned version of the Second Class Sleeper. Most of the express trains have about 2 to 3 coaches of this type. This class is more comfortable than the Second Class Sleeper and is also a bit more spacious. The windows are tinted glass and do not open. You might not be able to enjoy the sights, smells, and sounds of the scenery as you pass by like you would in the Second Class Sleeper. Ticket prices are fairly reasonable as well. For about $34 USD you can travel about 3,000 kilometer from Trivandrum to New Delhi in this class. I recommended this class if you wish to travel in a bit more comfort, and especially during the summer. Bedrolls are available inside the coach free of cost. Most of the facilities are comparable with the Sleeper Class, though. Here again, you will find the Indian middle class as your co-passengers. Don’t get upset if someone requests to share the magazine you have been reading. This is a very common practice in Indian trains. After reading a magazine, if you have kept it beside you, someone might just take it to have a look. And it will be passed from person to person in the compartment without your permission. The magazine will experience a trip around the compartment and be returned to you in due time. With a newspaper, the story is even more dramatic. If you are reading the news headline, someone will hold the middle papers and pull it gently... you are expected to release your tight hold so that he can pull out the middle section of the newspaper easily. This, by the way, is treated as absolutely courtesy! Here too, the newspaper will travel in loose sections and comeback to you after a well read tour. Generally people won’t request your books for reading. If you are a ‘selfish’ person, keep your magazine inside your bag immediately after you read it. You will find the well-to-do Indian traveler in these coaches. This is a good place for those who don’t want to join the crowd, or prefer a more luxurious trip. All the facilities available in SL is available here also. At a cost of about $48 USD you can travel about 3000 kilometer from Trivandrum to New Delhi in this class. Bedrolls are available inside the coach, free of cost. Like in any other air-conditioned coaches, you can’t enjoy the outside view due to the dark window glass. Tell that coach attendant to reduce the CHILL if you feel you are inside a freezer with berths and wheels! 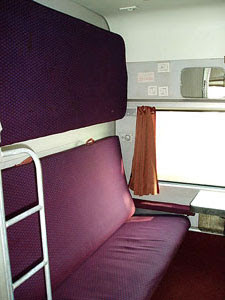 The AC 2-Tier Sleeper is found on many of the express trains in the Indian Railway system, and is more luxurious than the 3A. 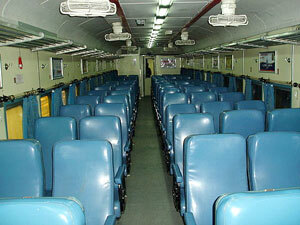 The First Class air-conditioned class is the highest luxury class in the India railway system for the regular routes. The cost is roughly comparable with the economy class airfare. For about $150.00 USD, you can travel from Trivandrum to Delhi on the India railway system in this class. A number of the important long-distance routes along the Indian railways have these coaches. You’ll find the elite class of Indians and business executives traveling in this class. On a side note, I once met a businessman on this class on a train, who informed me that he was afraid of flying, and therefore traveled only by train. Being a private compartment, you can travel days without even making eye contact with your other co-passengers. India travelers tend to mind their own business on these coaches, busy with the usual stuff - the newspaper reading, staring at the laptop screen, acting sleepy, etc. I have noticed this contrast between the First and Second or Third class on the Indian train in almost all of my India train journeys. Someone explained this to me as it being the product of the physical distances in the luxury classes. In a Sleeper class you are more physically close to the co-passengers and this increases the drive to interact with others. 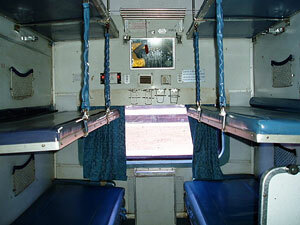 The AC Chair Car is generally attached only to the day-running trains on the India railway system. They look more like an economy-class seat on a plane, although with a little wider seat seating. It cost slightly less than the 3A. It’s alright for a decent day’s travel. Many express trains that run day routes on the India railway system have this class. This is the legacy first class coach. Only a few meter gauge express trains on the Indian railways have this class . This is similar to the First Class AC, except that it’s not air-conditioned! The cost for a ticket is between the cost for a Second Class AC and Third Class AC ticket. It’s spacious, although you will need to inform the station in charge prior to boarding the train for a bedroll. The bedrolls go for approximately Rs 20.00 per bedroll. There are a number of special trains called the Rajdhani (meaning "capital") and the Shatabdi (meaning "centenary") Express, which are among the fastest passenger trains on the India railway system. These trains only have the luxury class coaches. The Rajdhani Express runs between Delhi and many important cities. The Shatabdi Express runs between most important cities. The Shatabdi is a day running train with no sleeping berths. The India domestic flights and airlines are their main rivals. These are the luggage vans that are attached at the ends of each trains. If you have any oversized luggage, like a bicycle, motorbike, or camping equipment, you can store it away in this compartment. Luggage does not have to be booked while making your reservation on the India railway system. Just make sure you arrive at the boarding station a bit earlier than the departure time states, and book your luggage in the break van. The Luggage Office is located near the train platform. You will need to show your ticket as proof that you are traveling on the same train. Make sure you go personally to the break van to supervise the loading and unloading of your luggage. This will help you avoid any missing luggage. You are given a free allowance of 35kg for second class, 40kg for Second Class Sleeper and Third Class AC Sleeper, 50kg for Second Class AC Sleeper, and 70kg for First Class AC. You can usually go over by 10kg or so before they charge you for the extra. Note: You will need to pay the additional charge if your luggage amount is more than the free allowance, whether or not you store it in the luggage van. Most of the long distance trains on the India railway system have this facility. The pantry car serves meals, snacks, coffee, tea (chai), and cool drinks. "Room service" is available, where the wait staff brings your order to your seat, although you can go the pantry car and order your meals directly. You will need to pay for what you buy. The menu is basically vegetarian, although egg omelets are served. Chicken curry and other non-vegetarian dished are available at the stations for about a $1 per person. Prices are slightly higher for food than the local restaurants charge, but the food is pretty decent on an express train. The toilets on the India railway system are more or less similar for all the classes. Each coach is typically equipped with 4 toilets - 1 western style toilet, and 3 squat-style Indian toilets. Carry your toilet paper, though. Interestingly, the squat-type is more hygienic on a train, but using one of them on a running train requires some experience. 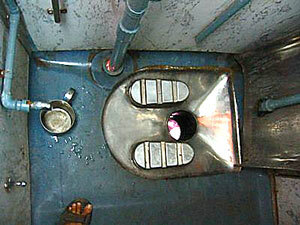 The squat-style toilet in an Indian train is basically a stainless steel basin installed on the floor, with footrests on either side. Be careful with small articles like spectacles, purses, toiletries, etc, as these can easily fall down the drain if accidentally dropped on to the toilet floor. Once, I’ve lost a bunch of keys when they accidentally fell from my pocket. Also, don’t forget to collect all your items if you choose to leave them over the small shelf fitted inside the toilet near the mirror. Unlike in the west you can use the toilet even when the train is at the stations. No one locks up them while the train is at the station. There are two latches for the toilet. One is a twin latch that can be opened and closed from both inside and outside. The other can be operated only from the inside. Lock this one when you are inside and leave the other one open. This gives the indication from outside that it is occupied. The toilets with the twin latch in the closed position are the unoccupied ones. Early mornings are a bit crowded at the toilets. You use the washbasin located outside the toilet for brushing your teeth and washing your face. The Traveling Ticket Examiner on the Indian railway system, or the TTE as he’s known, collects all the tickets on the Indian train. You have to show him your ticket on request. The TTE is usually dressed in a dark blazer with a name badge over his white shirt, and always carries a chart board with a huge clip over it. The TTE typically speaks fairly well, though in the Indian dialect of English. You will hoard of passengers around him towards the front on the India railway station, asking him questions all sorts of questions about the statuses of the waitlist. Upgrading your class, which is based on availability. Medical emergencies that arise during your journey. The TTE, and other train staff, is trained to give first aid, and will locate a doctor on the train if the situation is more serious. India railway encourages medical practitioners to identify themselves while making reservations. By the way, all the passengers are insured by the India railway system against accidents while at the station or on the trains. You can even ask him personal questions like how many children he has... the question will be appreciated! Typically one TTE is in charge for about 4 coaches, and will travel along with the train. For long distance trains, a new TTE takes over every day. The TTE locks the coaches from inside during the nights. Many night running trains have a few policemen as night guards. Anything is available for sale inside an Indian train and at India railway stations - from safety pin to quiz books to bananas to shoe polishing services to dried fruits. You name it, and it is yours (for the right price)! Not all the vendors are approved by the India railway system, though. A Indian train is a big bazaar on wheels, so be sure to carry a bunch of coins and small change during your India travel. The vendors are part and parcel of the India railway system. When a train reaches a station, the vendors swarm the windows like bees on a honeycomb, with everyone shouting out their fare for sale. All the goods sold are very thoughtfully suited to be exchanged through the 4-inch or so gap of the window grille. If you are sitting at the window seat, co-passengers may request to use your window to buy stuff they need. Generally the train stops for two minutes at each station, but at major stations this can be up to 30 minutes. Make sure you shift your huge backpack close to the exit door when the train is about to reach your destination. All sorts of frenzied activities like buying, selling, and boarding takes place two minutes before the train leaves. Departure is announced by a long whistle, after which the train slowly begins its journey again. You make an I-Ticket India Railway booking on the internet, but you have it delivered to an address in India. Lists of cities and towns where this courier service is available to are published on the site. Unfortunately, the India railway booking office does not courier tickets to overseas locations. You will have to provide a local address to send these tickets. Possible suggestions for destinations are a friend currently located in India or the hotel you might be staying at in India. You should allow for about two to three days’ delivery time. You make your E-Ticket Indian Railway booking over the internet, but you print the ticket yourself on your home computer. This is a good idea if you have access to a printer and you don’t want to have them couriered somewhere. NOTE: You can no longer pick tickets booked online at the Delhi train station. You have to register online on the India railway website in order for the site to process your purchase. An extra service charge of 1.8% is levied on the total cost of the tickets for internet bookings. The site takes Visa and MasterCard. A refund is made on the card if you cancel the ticket later. Make sure you note down the 10 digit PNR and the Transaction ID... you will need this if you want to cancel. You can make a maximum of four online bookings a month, and each ticket can be for a maximum of six passengers. One option for India travelers who anticipate traveling on the India railway system a lot is the Indiarail pass, which is available to foreign tourists from abroad. However, if you are not planning on traveling a lot by train, this is not worth the expense. Passengers on Indian trains can reserve tickets in person at the India railway reservation counters in India - there are hundreds of them all over the country. Most cities have ticket counters located at multiple locations for the passengers’ convenience. There are special quotas for foreign tourists. Enquire about this at the reservation enquiry counter on your route. India railway ticket counters are open 8.00 a.m. till 8.00 p.m. on weekdays, and 8.00 a.m. to 2.00 p.m. on Sundays. You can use credit cards for booking tickets at the reservation counters - look for the special Credit Card counters at the reservation office. You need to pay an additional Rs. 30 as a service charge. But the credit card queues are generally shorter than the cash queues. Use your discretion. Most large hotels in India offer travel services to their guests, and can arrange to get India railway tickets for you. For approximately Rs 30.00 per seat, they will get someone to stand in the queue for you and book the ticket. This is an easy way out for India travelers who choose not to experience the reservation counter experience personally. When searching for seat availability you will come across notations like "AVAILABLE- 0068", meaning that 68 seats are available for the day you have indicated. When searching for seat availability on particular Indian trains, you may also encounter notations like "WL 40/WL 10". This may look a bit confusing for a new user, but there’s a perfectly logical explanation and, once you understand it, this is a useful bit of information. Seats with berth are reserved on a first-come-first-served basis. Once the seats with berths are allocated, all other requests are under the "Reservation against Cancellations" category, popularly known as RAC. RAC is not a waiting list in the conventional sense. You can still board the train with a RAC ticket, and you do have a confirmed seat. However, a sleeping berth will be allotted based on availability due to cancellations. Only after the "seat only " seats are also filled does the real concept of a "waiting list" come into the picture, and this is where the "WL 40/WL10" notation comes into play. This notation on your India railway ticket means that you were the 40th person on the waiting list, but due to cancellations you are currently 10th on the waiting list. Now why, you may ask, would you need to know how many seats got cancelled? Good question. 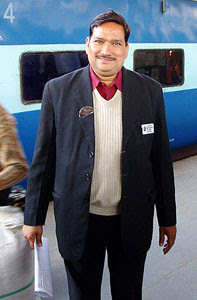 An experienced India railway traveler will know how many seats generally get cancelled on a particular train route, and can plan his trip accordingly. It’s definitely chancy, but to give you an idea, over 200 seats generally get cancelled for a Second Class Sleeper on an Indian train. Make sure you check the status of your ticket just before boarding an Indian train, to see if you have an RAC or WL ticket. You can do this through the internet, at the reservation enquiry counter, or over the phone. The telephone number for the Interactive Voice Response System is on the reverse of the ticket. You will need the 10 digit PNR printed on the upper left hand corner of the ticket to check your ticket type. You will not have a seat assigned to you if the status is WL. Contact the TTE to determine your chances of getting a berth. However you can still travel with this ticket in the General Compartment. Passengers on the Indian Railway System can cancel a reserved ticket and get a refund through the reservation counter. Generally the cancellation charges vary from a little less than $0.25 USD to slightly more than $1.00 USD, depending on the class. If you cancel a reservation at least a day in advance of your journey, excluding the actual day of travel, this range of cancellation fee will apply. If you cancel between one day and 4 hours before train departure, 25% of ticket cost plus the above mentioned cancellation fee is charged as a fee. You can still cancel the reservation, though, actually even after the train has departed. But the refund amount will vary, although typically you will lose about 50% of the total ticket cost. For a wait-listed ticket, there is no cancellation fee if cancelled in advance. A chart of cancellation fees for the India railway system is displayed at all the reservation counters. It shows the refund % based on class, time of cancellation, distance, etc. Tickets reserved at one station can be cancelled at another station. If you have booked over the internet, or using a credit card, the refund will be credited directly to your card. If you are not in a position to go to the reservation counters you cancel your ticket through the mail also. But I’m not sure if they send money abroad. The best way is to get it refunded directly over the counter. In case you are not in a position to cancel in person, you can deposit the tickets at the nearest major India railway station and obtain a Ticket Deposit Receipt (TDR). This can be done upto 30 days after the travel date. Then, an application for the refund needs to be sent to the Chief Commercial Manager-Refunds of the respective railway zone (southern, south-central, eastern, etc) where you have deposited the ticket. You need to attach the passenger’s foil of TDR as well. This can be done within 90 days of your scheduled journey. The format for this refund request and the address to which it has to be sent can be obtained from the station where you have deposited the ticket. You have the options of a Money Order or Crossed Cheque or Station Pay Order (encashable at railway stations). You can even claim the refund for the unused part of the tickets. Let’s say you met a nice friend on the train and decided to leave the train with her before your final destination. Before getting carried away with your newfound excitement, make sure you go to the TTE/stationmaster and let him know that you are terminating your journey. He’ll scribble something on the ticket, even God doesn’t know what it is, and add his signature. This is the proof that you have terminated your journey midway. At the exit, don’t hand your ticket to the collector. Let her that you terminated journey midway, and that you need the ticket for a refund claim. She’ll verify the ticket and give it you back.For the rest follow the instructions given above. You’ll receive a cheque long after you have forgotten about this. But I feel happy when I get a cheque when I’m least expecting one!! I’m not sure about tickets booked with a credit card. But in any case, ticket cancellation refunds are refunded to the card account. Generally this takes a little longer time than the conventional system. If you are not planing to travel it is always better to cancel the ticket before the journey date and collect cash directly. This will save you a lot of money, time and hassle. Lost ticket will not be refunded. You can get a duplicate for a lost or torn ticket, if you know the the 10 digit PNR and other details. A charge from 10% to 25% is collected based on the distance for the duplicate ticket. However, if you manage to find the original ticket, you can get a refund for the additional money you paid for the duplicate minus a 5% charge! Produce both the tickets at the reservation counter to process this refund. The Tatkal scheme is an emergency reservation scheme introduced on most train routes on the India railway system. Indian trains of this type used to be indicated with a T at the end of their train number, but no longer. Tatkal tickets can now be booked up to 5 days in advance not including date of journey, so 6 days’ advance really. These are in all other respects the same express trains with 2 or 3 such special reservation coaches attached to it. Tatkal tickets are only issued for the full length of the train’s journey, though you are still allowed to board the train at an intermediate station, and of course, there are exceptions to the rule. All the Tatkal (meaning "immediate") tickets come with a premium of approximately Rs. 50.00 to Rs. 200.00 extra, depending on the class, although they can be as high as Rs. 300. You need to produce a photo identity card (passport, drivers license, credit card, etc) at the reservation counter. The same will be asked for inside the train by the TTE. The ID number is noted on the ticket. This is basically to prevent the black-market sale of high demand Indian train tickets. If you are booking the Tatkal for a group of people (max 6 per ticket) any one member’s ID is sufficient. These tickets cannot be cancelled for a refund. The Tatkal system is a boon for emergency passengers. 14 million passengers a day. It is a huge cultural kaleidoscope on the move.... Salute to India railway for the amazing service they provide to the passengers! !